Over recent years, we’ve seen the police in the news far too much — for the wrong reasons. While mandated to serve and protect us, some unfortunately take advantage of their positions of power to abuse or break the law themselves. But it’s important to remember that such officers are statistically a minority, and the vast majority are working hard and not to mention potentially putting their life on the line to do their job well and with the right intentions. The Pierce County Sheriff’s Department in Washington state set out to prove just how human cops are. It all begins with a dispatch call about a ‘noise disturbance’. Detective Sergeant Gary Sanders promptly arrives on scene to investigate the matter. All seems routine — except the scene happens to be a dance school, and a group of young girls appear to be the ‘law-breakers’. “The noise is way too loud, and I’m going to have to write you a ticket,” the officer tells the dancers. But the youngsters have a different idea. They will instead challenge the detective and his fellow colleagues to an epic ‘dance-off’. Sergeant Gary Sanders proudly accepts the challenge and they set a time and place for the ‘epic’ battle to take place. 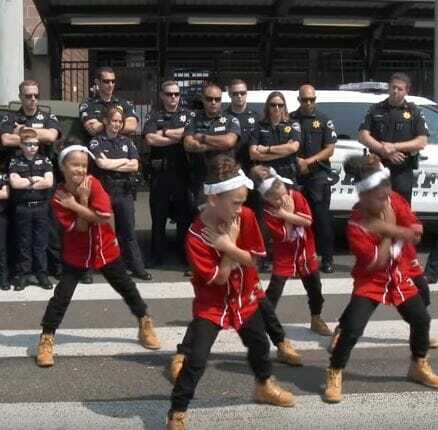 This is all, of course, a mock situation, organized by the police department and Image Dance Studio, where the young girls are members, as a way for the cops to get closer to their community. And what a great idea it was! It’s of course, not much of a challenge, with the young talented girls emerging as the clear winners. But my, is it fun to watch the officers give such a valiant effort! Thankfully, the whole thing was recorded and the wonderful and rather hilarious video is now spreading like wildfire. Just have a look for yourself below, and you’ll understand why. What a great way for the police to show their human side and prove they are just like the rest of us. The vast majority of police officers work hard every day to serve and protect as they should, and for that they deserve to be admired and appreciated. Share this video with your family and friends if it brought a smile to your face and to recognize all the good cops out there!